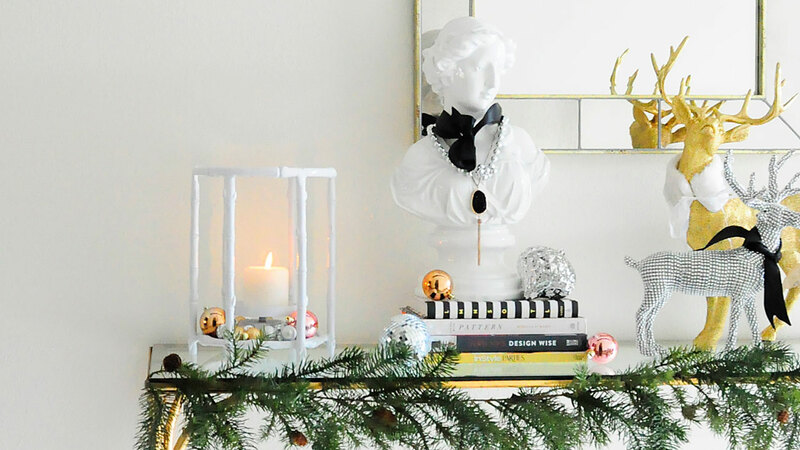 I am thrilled to be sharing my 2017 Blush, Silver and Gold Christmas Decor with you as part of the tour of homes that Jess from Domicile 37 is hosting! 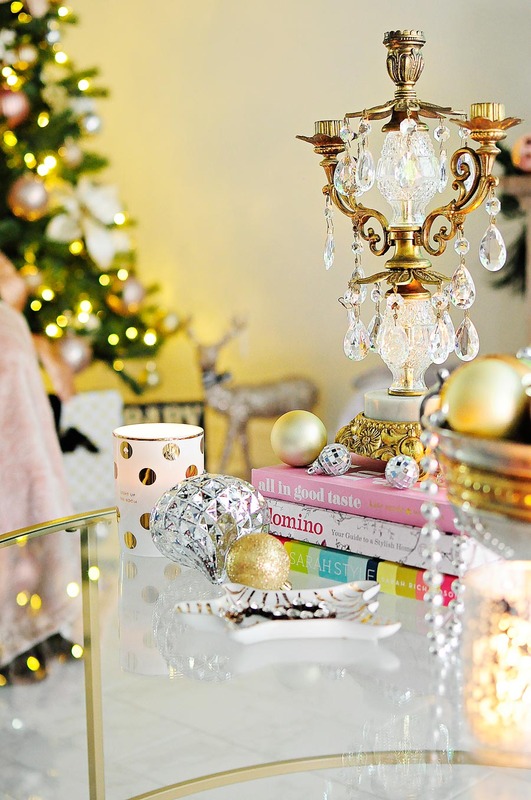 My decor theme this year is blush/millennial pink with accents of white, silver and gold and splashes of chinoiserie. I know…totally a lot going on there, but somehow it all worked out and is beautiful. There’s one room I’m holding off on fully revealing until this Friday as part of another tour of homes I am in, and that room is the dining area. BUT I will give you a sneak peek since I already have you here. And without further adieu, Pee Wee and I would like to welcome you to our winter eclectic holiday decor tour. 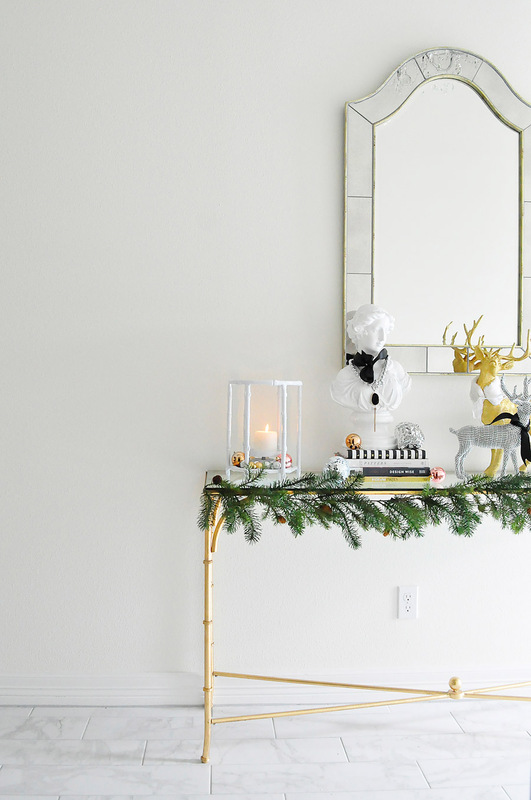 This space was empty up until around Thanksgiving when we hung the mirror and moved the gold console table from my feminine home office out to the foyer area. I love this space now because it still feels grand and open, but the mirror and foyer table add a bit of warmth and glam to the space. The decor I kept simple and a bit monochromatic and metallic to match the feel of the foyer. My bamboo console is one of my fave pieces of furniture in our home. I love how wide it is, yet it still feels airy and not heavy. 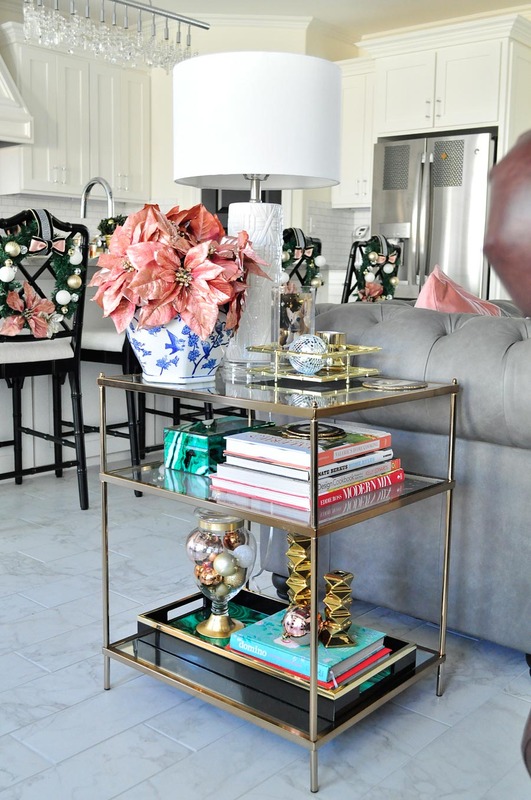 Sadly it seems as if its been discontinued, but this gold console table is similar and has more storage/display options. Finding those bamboo hurricane candle holders was one of my luckiest HomeGoods finds EVER. And much like the vintage candelabras, I bought a pair. 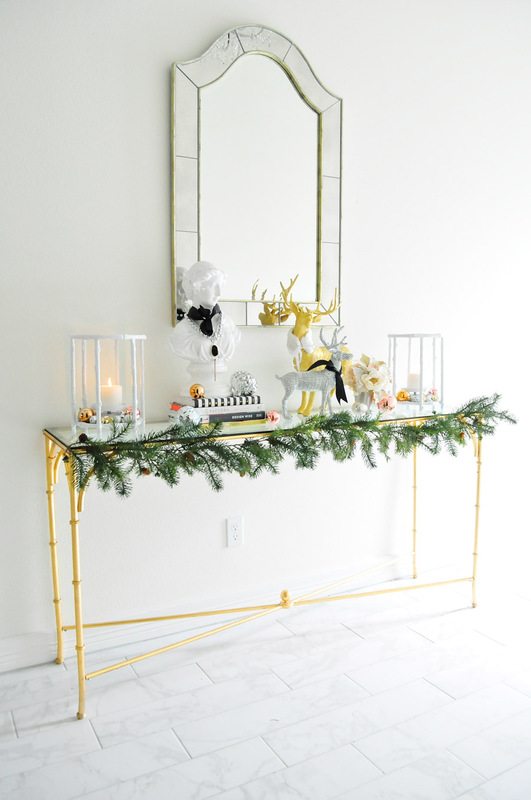 You can snag a similar gold bamboo pagoda candle holder pair for a fab price. At the time of this post, we had just moved in a couple months before, so it does look a little sparse, I know. In our living room, it really is three rooms in one– it’s open to the kitchen and dining space, so it’s all open concept as they would say on HGTV. This is where the bulk of the decor is and also where our new sofa is. My lucite floor lamp looks so chic in this space. 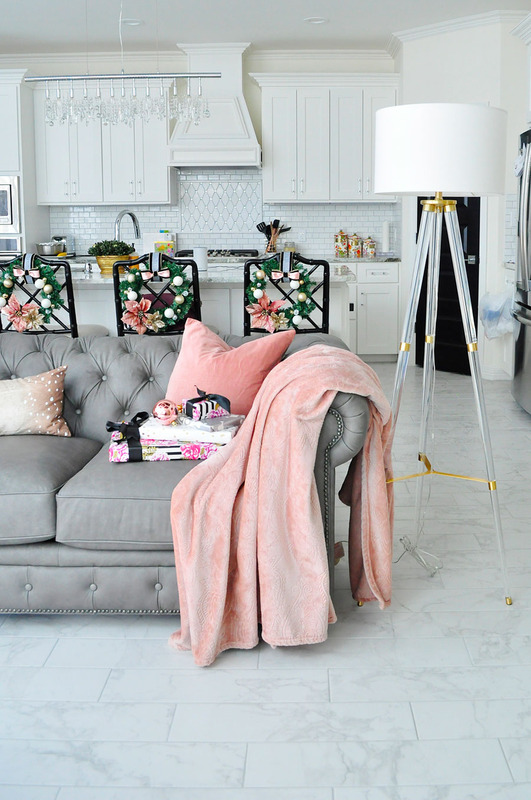 The chesterfield is a new addition to our home, and we couldn’t love it more! Pee Wee included, see below…silly boy. The antelope or fawn print pillow adds some interest and contrast to the space. I have the same print on curtains in my feminine home office– I simply adore antelope print. We’re since added a Karastan rug and new vintage bamboo end tables to this space, so it doesn’t feel so bare. Our linear crystal chandelier is one of my fave lighting purchases for the kitchen. 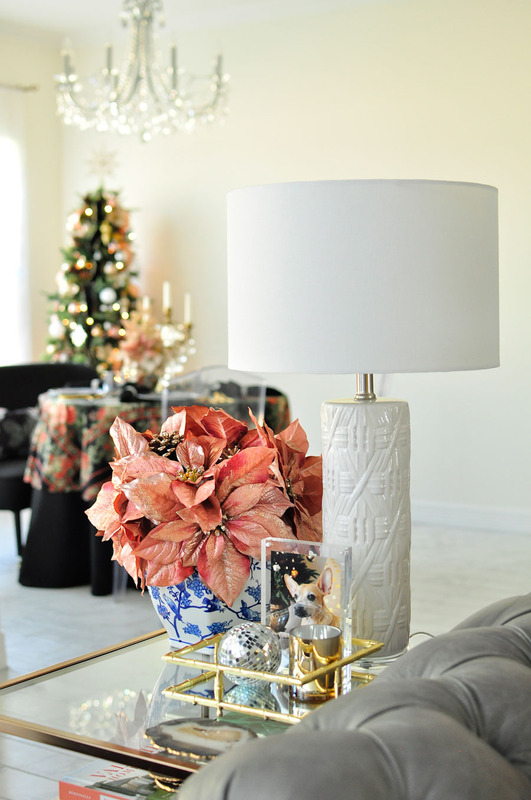 Our end table also got a bit of holiday cheer with some faux blush poinsettias and ornaments in an apothecary jar . From this angle you get a peek into the dining space, which is small but totally decked out in decor. 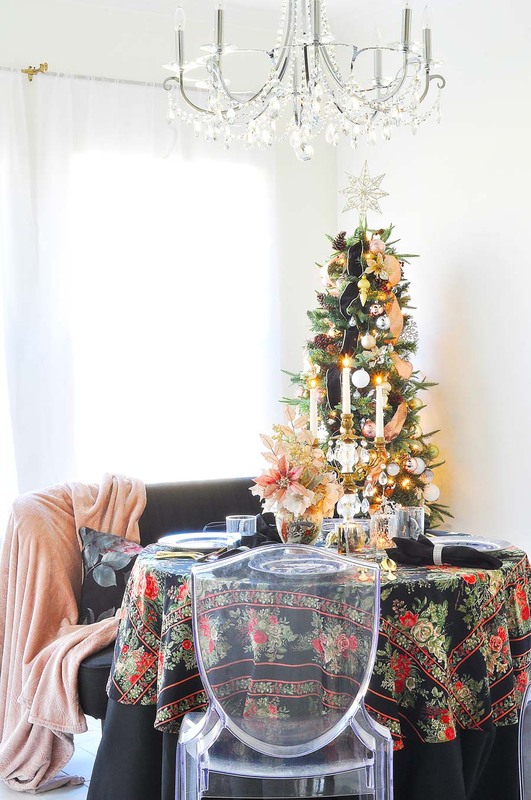 See more of our small dining space holiday decor. I love how this space is coming together, and the low back of the chesterfield sofa makes it feel so open no matter where you are in the space. My next item to procure for our home is a soft rug (spoiler alert, we chose this gorgeous gray rug). Truth be told I despise our TV stand (I bought it during my reclaimed wood phase of 2014) but for now it stays. Maybe 2018 will be the year I finally ditch it for something more timeless and my style. *Note: the TV stand is gone and has been replaced with a gray marble fireplace TV stand, which you can see in our fall home tour. 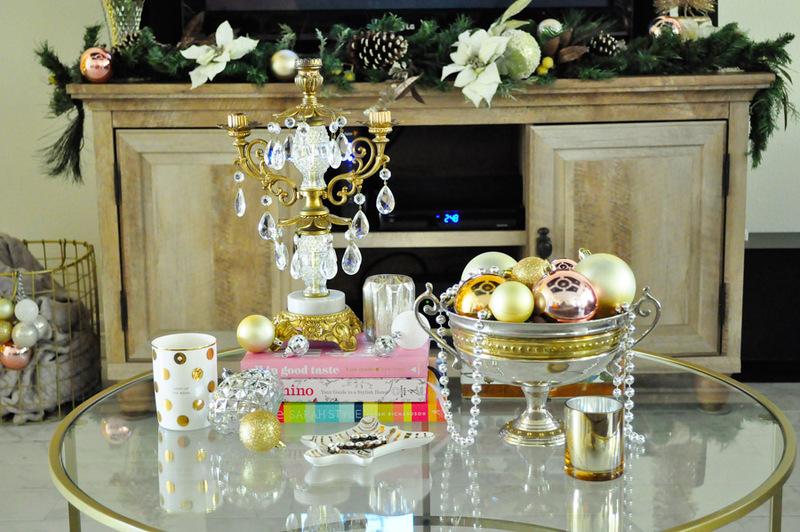 The candle holder is so glam and it’s a perfect vintage touch for my coffee table. 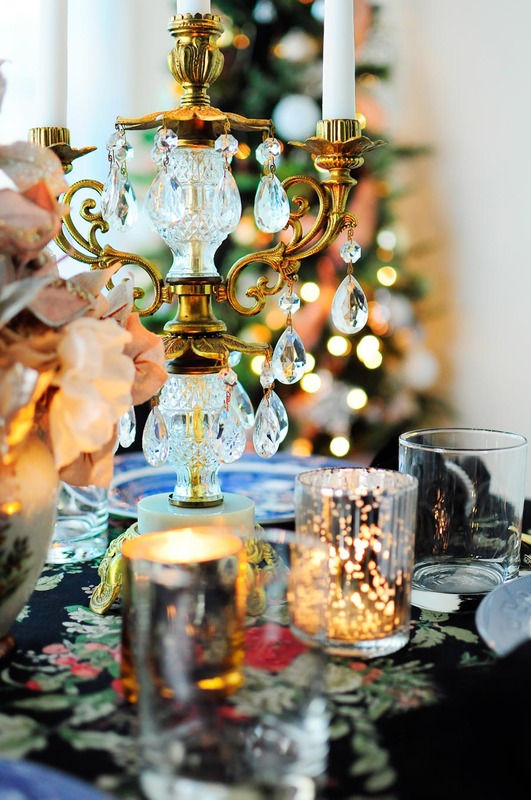 Here’s a similar crystal candleabra I love. 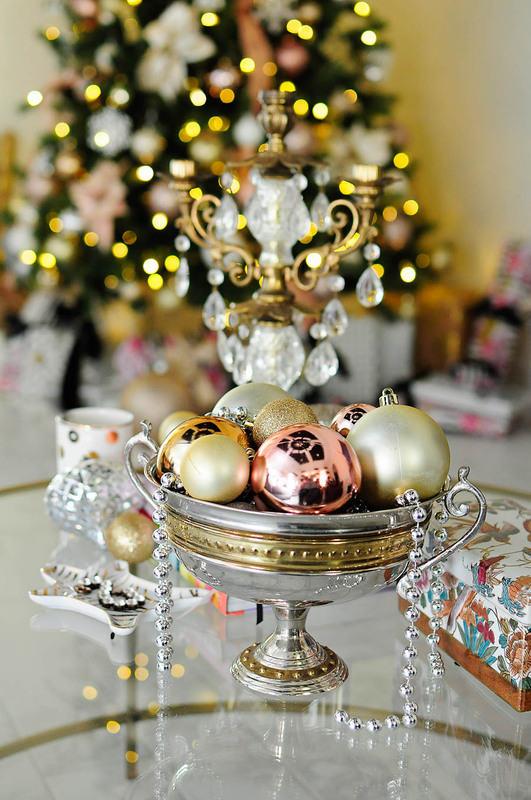 I always find vases, bowls or random glass jars to put spare ornaments in. 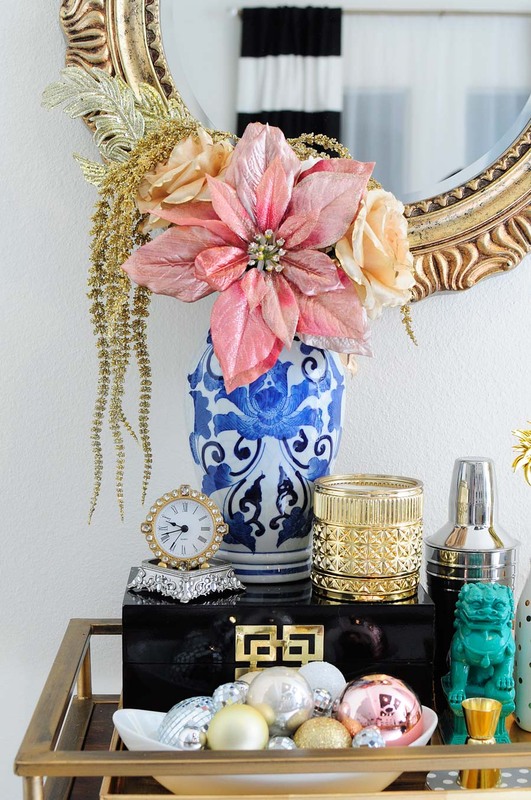 It’s an easy way to fill in decor on end tables, countertops, etc. Decorating this glass round coffee table is always fun. 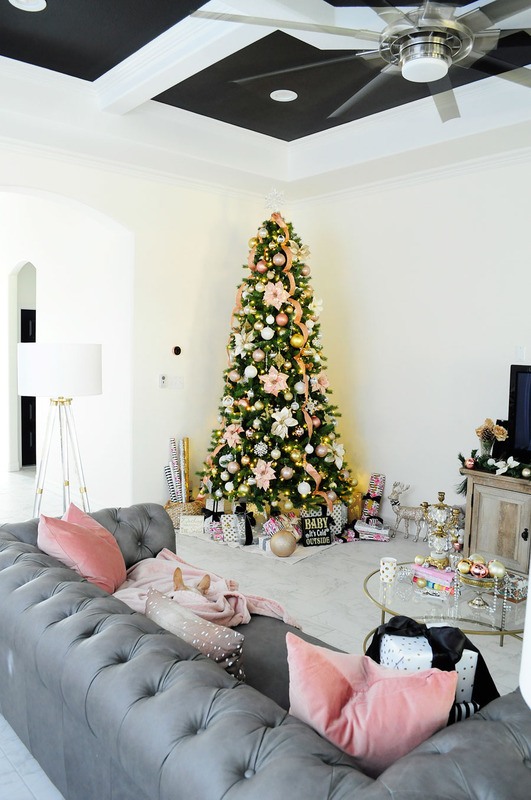 I wrote all about my blush and gold Christmas tree earlier this week, so you can read more about it and see detailed photos of the decor. For now, here’s the highlights. 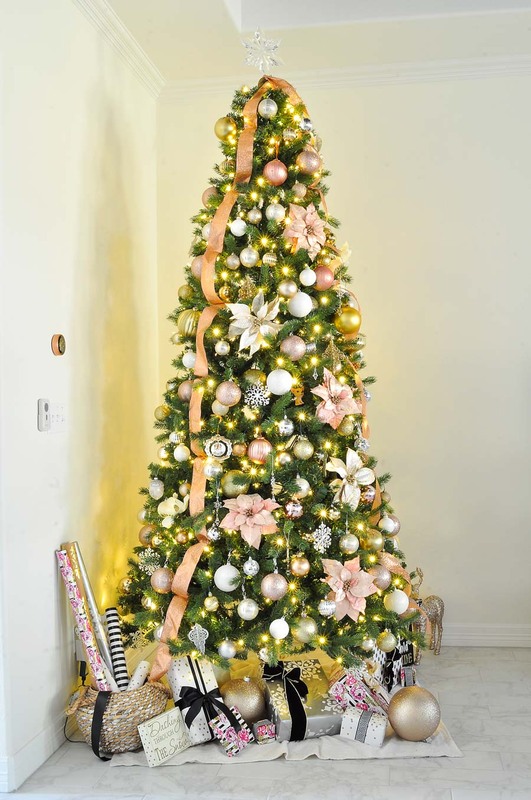 We love our 9′ tall Christmas tree with LED color changing lights. It’s the most realistic tree I’ve found for the size and price. 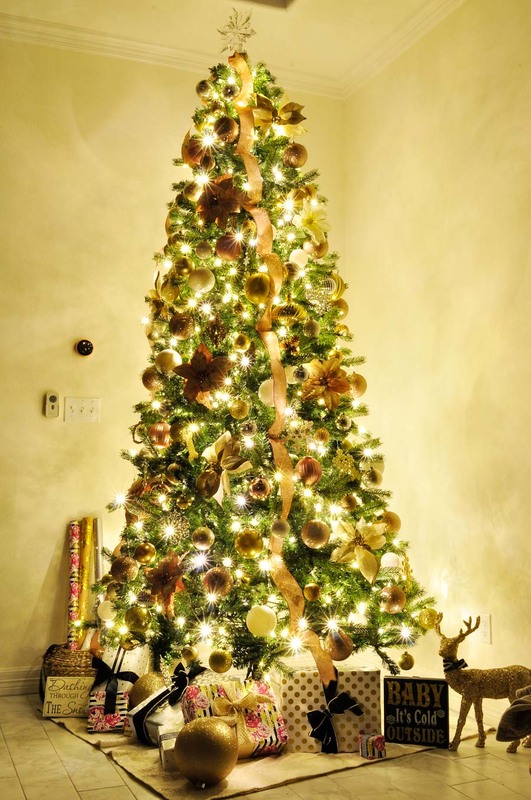 The warm glow of a Christmas tree is my most favorite thing about the holiday season. 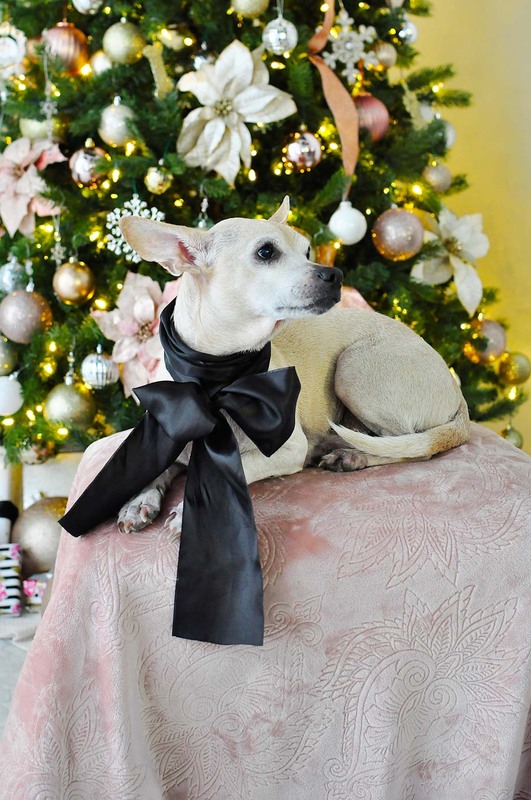 Pee Wee loves to lay by the tree and enjoy the sparkle and warmth. 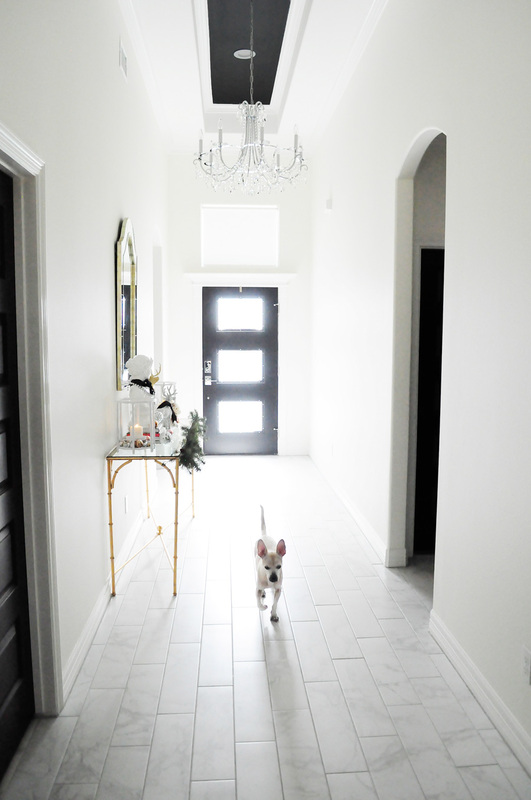 The decor in here is very simple for ONE reason…we just moved into our home late September, and I am petrified of ruining the finish on our painted white cabinets. 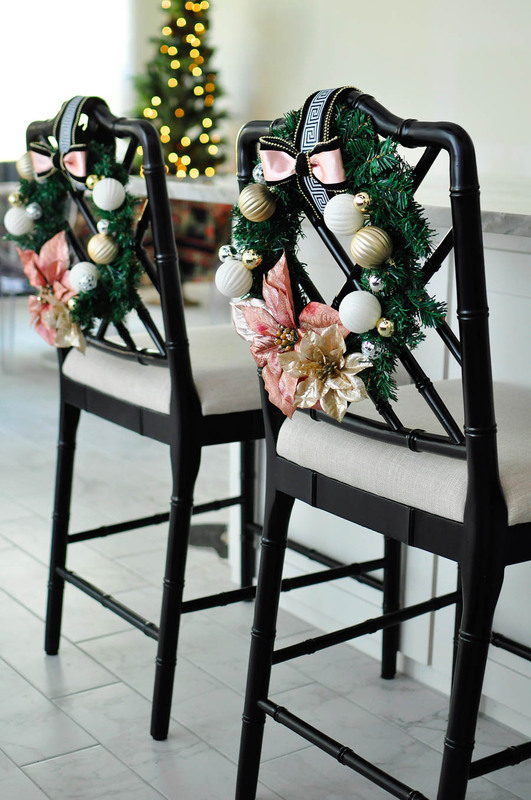 So I opted to decorate the back of our counter stools with gorgeous DIY chair wreaths. We are still smitten with these black bamboo counter stools- they’re so comfy, easy to maintain and look incredibly chic in our kitchen. You can read my review of the Dayna counter stools if you want more info. 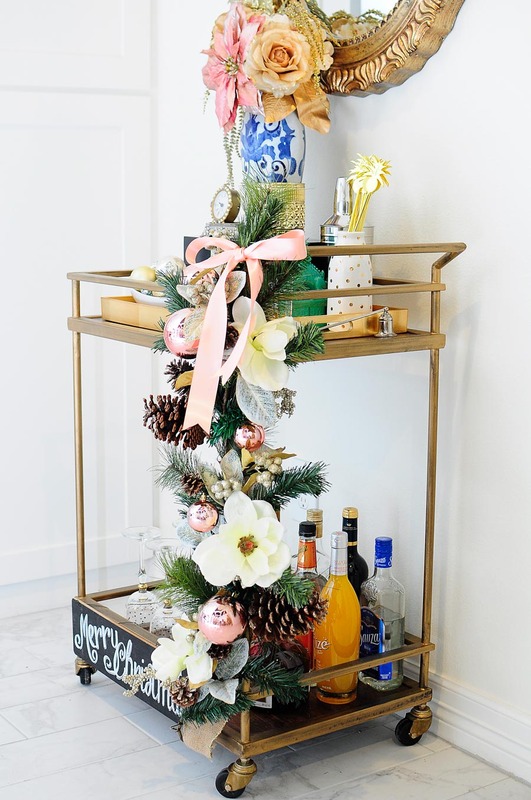 For the bar cart, I added some garland and other fun accessories to keep it festive. 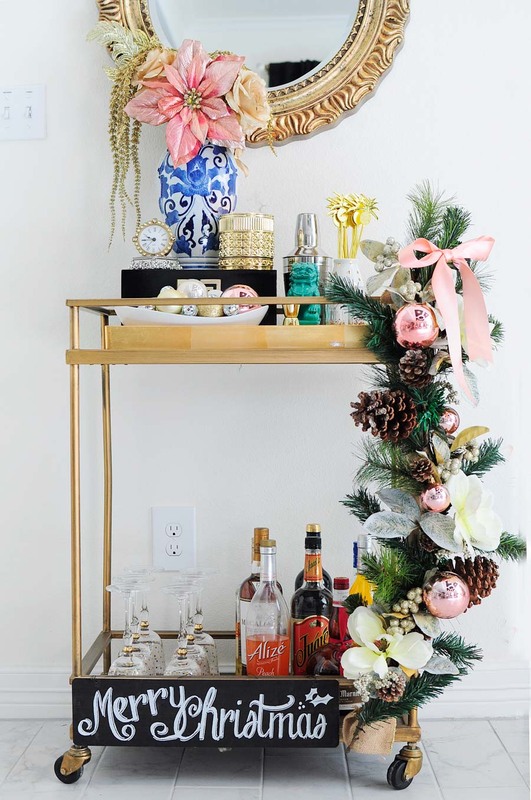 I’ll break down all the styling in a post next week for both a coffee and a bar cart to help prepare you for holiday and New Year’s festivities. I truly enjoy mixing and matching styles to create interest. Blush florals mixed with blue and white chinoiserie is a fun combo. I’ve since changed the mirror in this area to a vintage bamboo mirror, which you can see in my fall home tour. I’m constantly changing things up as I figure out what I want my home to be like. And now for a sneak peek at our 10×10 dining “room” or breakfast nook. I wanted to keep the space feeling large and airy while also having a gorgeous table to dine at. I think I’ve succeeded and can’t wait to show you more photos of this space on Friday. Here’s a sneak peek though. Make sure to come back Friday to see all the details that make this small space so glam and special. Here’s the other one of my vintage crystal chandeliers- the other was on my round gold coffee table . I love buying things in pairs- it makes them more versatile. 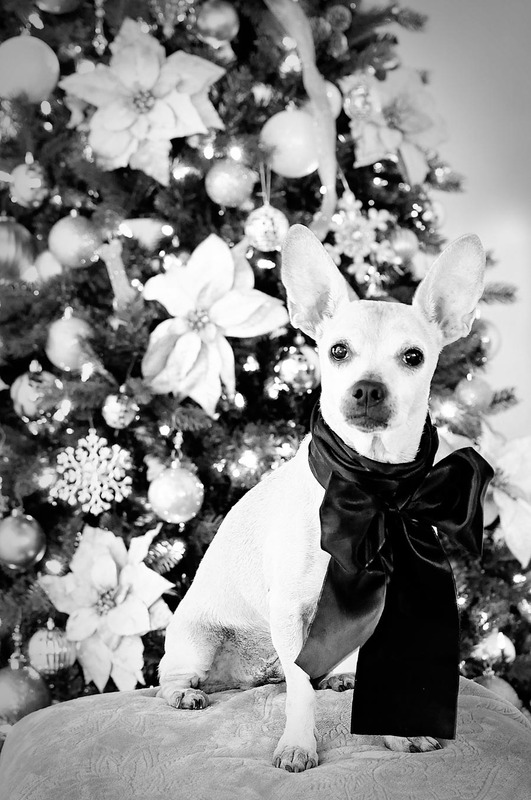 Pee Wee’s full color holiday portrait! He and I (and Daniel, too!) have enjoyed having you over and thank you for taking the time to view our home decor. 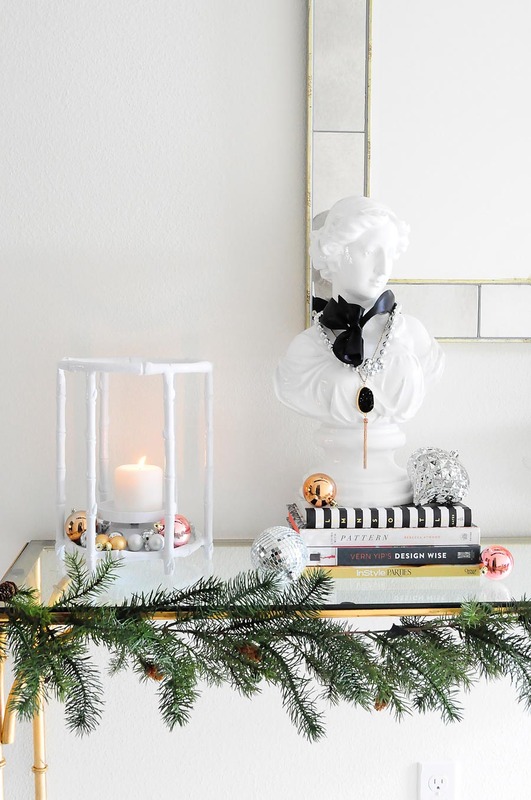 It may not be the fanciest or grandest, but to us it’s simply splendid and we’re honored to showcase how we decorate our home. Ok, one more Pee Wee photo. He’s the CUTEST. Gah. I love him more than words can describe. 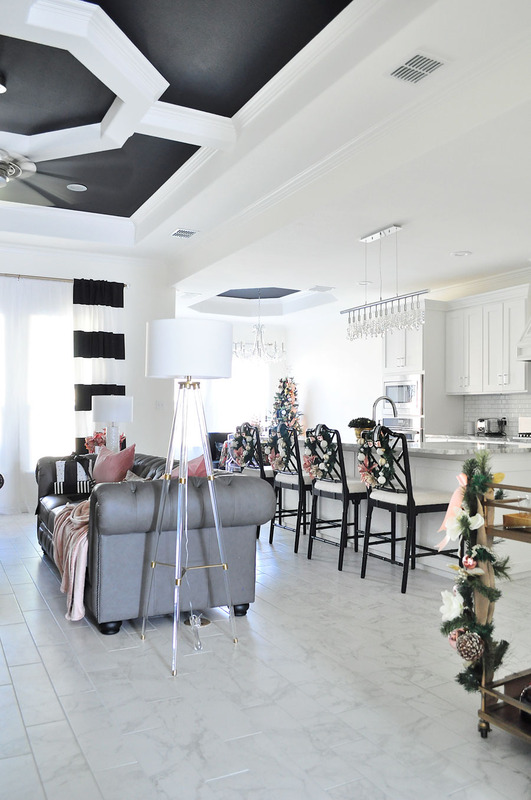 There’s so many more homes and decor to see, so click around and be inspired by the other eclectic bloggers below, but for now I’m handing you off to Erica from Designing Vibes. I LOVE her style! Beautiful as expected Monica. 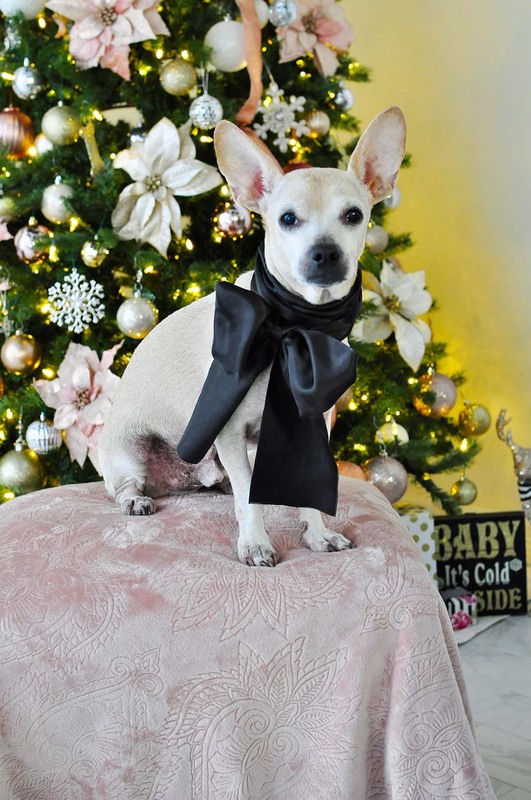 Your home is beautiful, and PeeWee is dashing. Christmas is sooooo much better with a dog to share it with!! Monica! Your house looks amazing! I am shocked to see all that you have done in such a short time frame. BTW, pink does your house good! Love it! your home is so glamorous and beautiful! 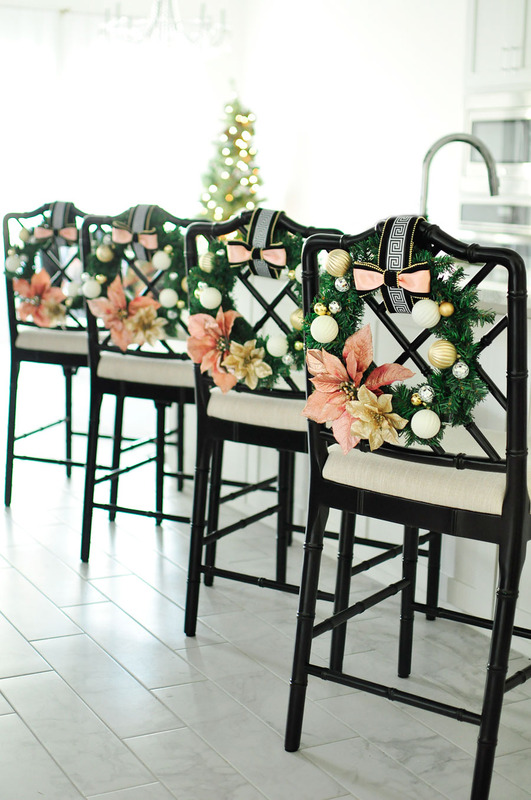 i love all of the pink touches and love the decorated bar stools. the foyer is my favorite! Beautiful! 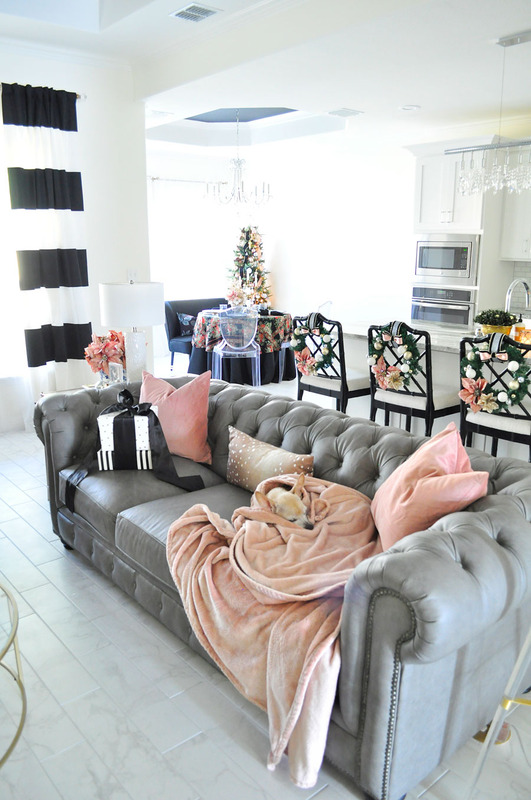 Can you please tell me where you purchased the (1) pink throw in the living room and (2) console table in the hallway? Thanks! Wow Monica! You've done so much to your new home. It's SOOOOO pretty! 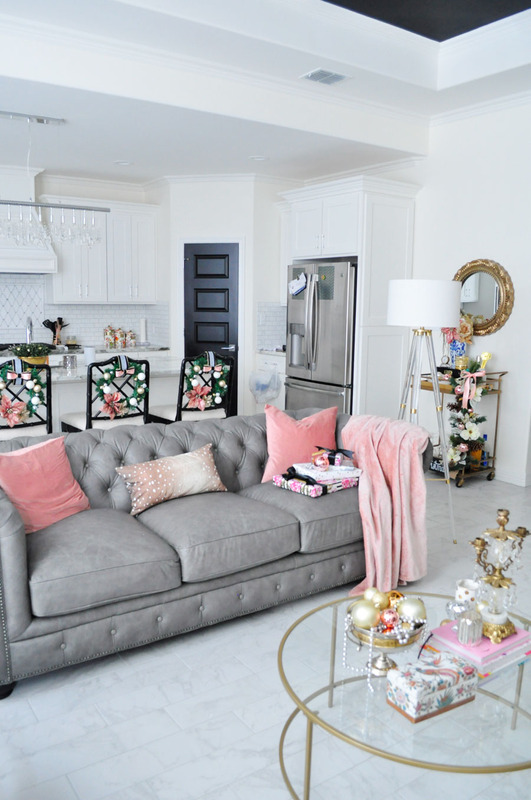 I love seeing each of the living spaces and I think I pinned about every other picture. 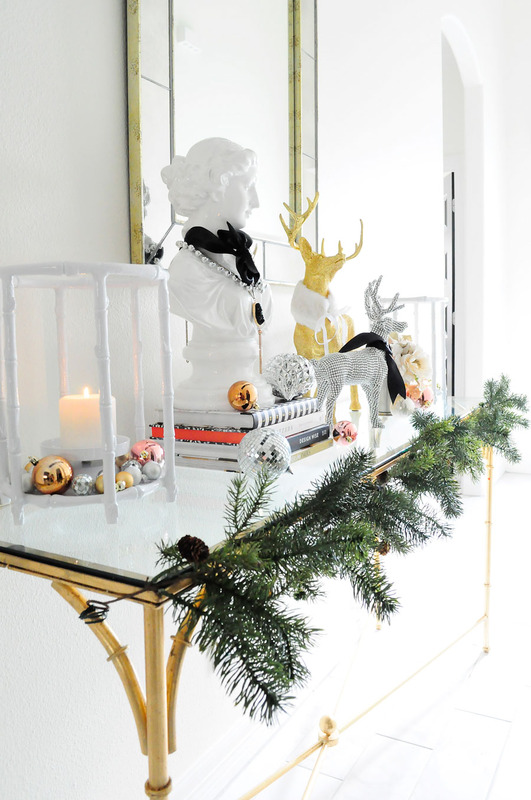 lol Love your holiday decor this year! Merry Christmas. Monica, everything is lovely, as always. I am so in love with your candelabra. Where might I find one like it ??? thanks and Merry Christmas. Hi Kathryn! 🙂 I'd recommend scouring Etsy, eBay or ebth.com for something similar. This was an estate sale find, and I was so lucky to snag a pair. Thrift/vintage shops are also good places to find stuff like this. Wow, Monica! These photos of your home are magazine worthy!! Beautiful job!! Every area is styled to perfection! That is so kind of you to say, Karrie! I worked really hard on these photos. So glam and gorgeous!! Merry Christmas! Monica, your new home is GORGEOUS and you have decorated it so beautifully. I love your black/white and blush, so pretty. Every detail is stunning. Thank you so much, Marty! I love your home so much, too- especially the garland on your stairs. Swoon!